A national high-speed rail plan was put forward by President Barack Obama in April 2009, just months after he set aside $8 billion in stimulus funds to begin such an undertaking. Following the announcement, forty states and the District of Columbia requested over $100 billion for high-speed train projects. At the end of January this year, however, the White House selected 13 passenger rail corridors in 31 states to receive stimulus funding. High-speed rail projects in California, Florida and Illinois were the big winners. — California: $2.3 billion to begin work on an 800-mile-long, high-speed rail line tying Sacramento and the San Francisco Bay area to Los Angeles and San Diego. — Florida: $1.25 billion to build a rail line connecting Tampa on the West Coast with Orlando in the middle of the state, eventually going south to Miami. — Illinois-Missouri: $1.1 billion to improve a rail line between Chicago and St. Louis so that trains travel up to 110 mph. — Wisconsin: $810 million to upgrade and refurbish train stations and install safety equipment on the Madison-to-Milwaukee leg of a line that stretches from Minneapolis to Chicago. — Washington-Oregon: $590 million to upgrade a rail line from Seattle to Portland, Ore.
— North Carolina: $520 million for projects that will increase top speeds to 90 mph on trains between Raleigh and Charlotte and double the number of round trips. In addition to the stimulus investment, Congress has approved $2.5 billion more in high-speed rail funding for the annual federal budget this year. Still, that is budget to budget, year to year support for projects that take 10 to 20 years to build. And, if a system is implemented nationally, it will cost hundreds of billions of dollars — not counting inflation over the decades it will take to build. By spreading the $8 billion among so many states (31), President Obama ignored calls from transportation experts and high-speed rail advocates who maintained that the only way to build support for the program would be to concentrate funding on only two or three projects — to not only accelerate construction, but also get those high-speed lines up and running to be seen as an example of success throughout the country. In the end, only the line in Florida (Tampa to Orlando), which received $1.25 billion on top of the hundreds of millions of dollars in local private and public funds already raised, is expected to be finished in the next five years. Still, “high-speed” has been a loosely used phrase in America. Between Washington, D.C., New York and Boston, the Acela Express — Amtrak’s version of high-speed — can reach 150 mph, but only for short stretches and averages just 80 mph. The definition of “high-speed” in Europe, however, is trains that travel at least 155 mph with speeds that oftentimes exceed 200 mph. Currently, applicants nationwide for the $8 billion in federal high-speed rail funding are planning medium-speeds of 90 to 110 mph and high-speeds of 130 to 150 mph. That said, as early as the 1930s in America, trains routinely reached speeds of 120 mph and higher. California is the only state so far to propose a high-speed rail network with trains traveling up to 220 mph. A trip from Los Angeles to San Francisco, for example, will take about 2.5 hours. Still, that 2.5 hour train ride is just over an hour by air. Then again, the train will take you to San Francisco’s city center from Los Angeles’ city center — connecting directly with mass-transit. Also, you will not have to owe your brother-in-law any more favors for picking you up from the airport. The most likely determinate if people will get off planes and onto trains: cost. Already, a one-way, rush-hour train ticket (purchased a week in advance) on the Acela Express from New York-Penn Station to Washington, D.C.-Union Station costs upwards of $155 for the 2.75 hour ride. That same route by air ranges in cost from $103 to $200 — roundtrip — for the 1.5 hour flight. Although, the Acela Express line was one of only three Amtrak lines to turn a profit in 2008. But, if California is the bellwether for the future costs of riding high-speed rail, then it will be only slightly cheaper than the Acela Express. The projected average ticket on the high-speed train from San Francisco to Los Angeles is $105, or 83 percent of comparable airfare. Last year, the state said prices would be set at 50 percent of comparable airfare and predicted a ticket from San Francisco to Los Angeles would cost $55. 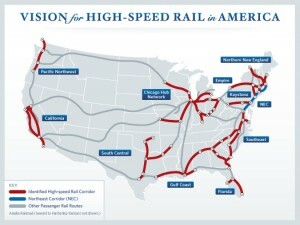 Still, much of America’s high-speed rail plan is just lines on a map. It is 2010, and ground has yet to be broken anywhere.